Forster's Tern is the only tern restricted almost entirely to North America throughout the year. 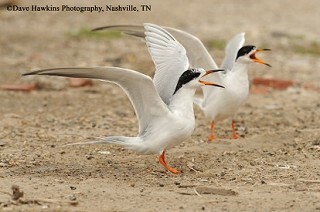 Of the medium-sized terns found in the eastern United States, it is the most likely species to be observed in Tennessee. It stops along lakes and rivers during spring and fall migration, but is rarely present during the winter or summer. It breeds on freshwater lakes and marshes in scattered locations in central North America, California, and along the Atlantic and Gulf coasts. It winters along the California, and lower Atlantic coasts, with smaller numbers inland. Description: The Forster's Tern is a medium-sized tern, with pale wings that are darker at the tip, a long, deeply forked tail, and orange legs. In breeding plumage (March-August), it is mostly white with a pale gray back, a black cap on the head that extends to below the eye, and an orange bill with a black tip. In non-breeding plumage (August-February), the black cap is reduced to a black patch on the side of the face. The top of the head and forehead are white, the bill is black, and the feet are a duller orange. Males and females look alike. The ear-patch of non-breeding and immature Forster's Terns is distinctive. Common Terns, less common than Forster's Terns in Tennessee, also have a black cap in breeding plumage, but bill and legs are more red than orange. In non-breeding plumage, the black patch on the side of the face extends to the back of the head. Diet: Small fish and arthropods. 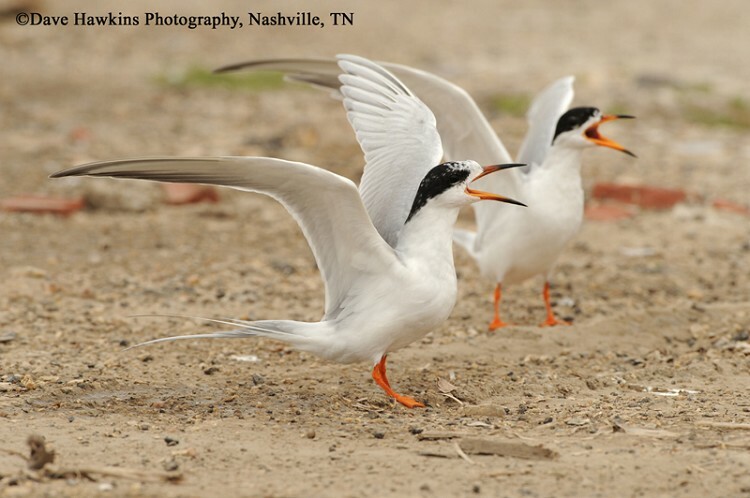 Status in Tennessee: Forster's Tern is fairly common during spring and fall migration, and rare at other times of the year. In spring, it usually arrives by late April and departs by mid-May. In fall, it is in the state generally from late July to early October. It is more likely to be found in Tennessee than the similar appearing Common Tern. A sighting on J. Percy Priest Lake on 28 December 2009 was a very late record of the species in winter (S. Somershoe). The Forster's Tern is primarily a "marsh tern," breeding in fresh, brackish, and saltwater marshes. The nest is often built on muskrat lodges or on mats of floating vegetation. This bird is named after the European naturalist, and Lutheran pastor, Johann Reinhold Forster (1729-1798), who is best known as the naturalist who accompanied James Cook on his second Pacific voyage. Best places to see in Tennessee: Most likely to be seen along lakes and rivers, in all regions of the state, between late April and mid-May, and again in late July and early October. McNicholl, M. K., P. E. Lowther, and J. A. Hall. 2001. Forster's Tern (Sterna forsteri). The Birds of North America, No. 595 (A. Poole and F. Gill, eds.). The Academy of Natural Sciences, Philadelphia, PA, and The American Ornithologists' Union, Washington, D.C.